If you’re a high school senior who’s college-bound, or the parent of one, you’re likely trying to make sense of the stack of financial aid award letters you’ve received. Colleges communicate their financial aid offers to students in a myriad of different formats and templates, so it can be difficult to compare the awards. That’s why we created our My College Cost Calculator. The tool allows you to lay out your financial aid awards side by side to evaluate net costs and really understand your best option. It’s simple to use and you can save and print your results. Here’s how it works. Start by visiting mefa.org/my-college-cost-calculator. Type in the names of up to four colleges that you are considering at the top of the screen and then record each school’s costs. You can find this information with your financial aid materials or on each school’s website. Next, record all of the gift aid you received from each school, which includes grants, scholarships, and any other awards that do NOT need to be paid back by your family. Include the gift aid that appears on your financial aid award letters, as well as any other scholarships you have been awarded from outside organizations. Next, record the amount you received in Federal Direct Loans, as well as any amounts you received in school-specific loans. Do NOT include any PLUS Loans that appear on your financial aid awards, as these are merely suggestions from the financial aid office and not guaranteed funding. Finally, record any other resources you have received that will help you pay for college costs, including gifts from relatives or friends, employer tuition remission, and any other financial resources not already listed. Once you input all of your information, the bottom of the calculator will show the sum of your costs, financial aid, and other resources. Using that information, it will calculate your remaining cost at each school. This represents the minimum amount you will need to pay. As a family, review this information and start creating a plan to pay your remaining cost. You need to ensure that you will be able to cover that remaining cost for every year of college before committing to a school. Using the print icon at the bottom of the page, you have the ability to print your information or save it as a PDF by selecting the PDF option as your printer name/destination. At the bottom of the screen, we’ve included notes that can help you as your review your financial aid and evaluate how much you’ll need to pay at each school. 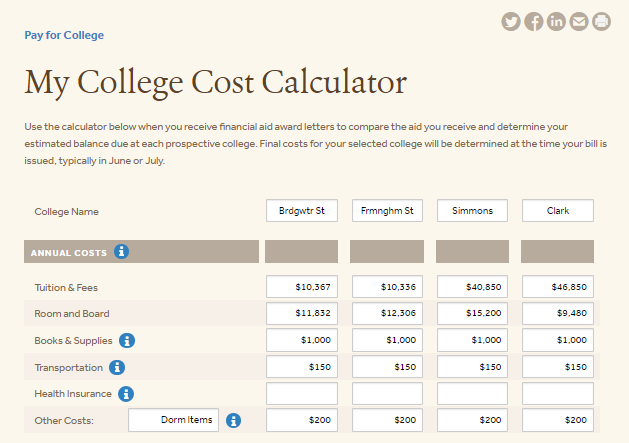 After you use this College Cost Calculator, you may want to speak with someone about making a plan to pay your remaining cost. We have college planning experts available to answer your questions and walk you through your options. Please reach out to us. You can contact us via phone at (800) 449-MEFA (6332) or email at collegeplanning@mefa.org. We discuss work study, the John and Abigail Adams Scholarship, how scholarships affect financial aid, subsidized vs unsubsidized loans, Federal Direct Loan limits and interest rates, MA state aid, and how to use your college savings funds.